In addition to the latest news and info on concerts and recordings, you'll find YouTube videos of the Krugers, exclusively provided by the Krugers themselves, their own photos from on the road, and so much more! Check it out, and be sure to let us know what you think... We are committed to keeping the website vibrant with new items added regularly. * and the 'Night of Stars' concert at Lovett Auditorium, Murray State University, KY, on 29 November 2007, when the Krugers will perform their composition 'Music from the spring: a romantic serenade for banjo, guitar, bass & Orchestra' with the MSU Symphony Orchestra. The Kruger Brothers International Fan Club Inc. has been founded by Don & Brenda Baldwin and Emily Boyett as a non-profit organization Oklahoma. The band has also launched a MySpace site. Josep Traver's La guitarra acústica: Bluegrass is the first book to be published in Spanish on bluegrass guitar. It is suitable for beginners, as well as for advanced players who want to deepen their knowledge of acoustic folk guitar in general and the bluegrass style in particular. It covers different aspects of bluegrass guitar: general characteristics, repertoire, accompaniment, chord inversions, harmonic substitutions, improvising, scales, arpeggios, and techniques such as flatpicking, crosspicking, and Carter family style. The text is divided into nineteen parts of progressive difficulty, so that the sections of most interest to the reader can be treated as independent units. Format: 74 pages and a CD with 99 audio tracks of all examples. All the exercises are shown in standard notation as well as in tablature. Price: €23. On sale at Casa Beethoven y Audenis, Barcelona; Musical tres y Platero, Badalona; or online from Dinsic Publicacions Musicals SL, Santa Anna 10, E 3a 08002 Barcelona; telephone +93 318 06 05; fax +93 412 05 01. Lluis's new CD will be released in December 2007. 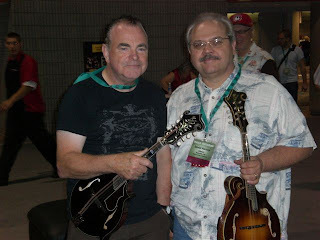 Guest artists on the album include Tom Corbett (mandolin) and Tim Carter (banjo), who also mixed the CD in Nashville. The ten tracks include bluegrass, jazz, and Irish tunes; all but two are original compositions. Two tunes from the CD can be heard on MySpace. Lluis is also writing tabs and articles for Tom Nechville's newsletter Banjovia. Tabs for the David Grisman tunes 'EMD', 'Opus 38', and 'O'Banion's wake', as well as Liz Carroll's 'Lost in the loop', can be downloaded at the Nechville website. And a video of the Lluis Gomez Quintet on stage at the 2007 Johnny Keenan Banjo Festival in Longford, Ireland, can be seen on YouTube. Thanks to Jean-Marie Redon and Sharon Cort for news, photos, and video footage of the TV tribute to the late Mick Larie, produced by Patrick Sébastien, one of the main TV producers in France. Mick Larie was one of Sébastien's closer collaborators for more than 15 years. They also, with time, became close friends. This is the reason why Sébastien called me and said he wants to do something special for Mick in his next TV show. He asked to have the band Long Distance Mick and myself had founded a long time ago. In the past we had made several TV shows with Sébastien, playing with some well-known artist like Sacha Distel for example. He also asked to have some US artist. My choice was naturally going to Sharon and Kathy as they were close friends with Mick. Part of the show can be seen on internet here, together with footage of the early Long Distance band playing 'Foggy Mountain breakdown'. I'm really excited about it because I'll be playing these gigs with mandolin wizard Martino Coppo. He's been a guest musician in my previous CDs and I'm so happy about this musical partnership. The residential course begins with a reception on the evening of 7 May, followed by four days of bluegrass music classes, elective workshops, and two faculty concerts. The total cost for all activities is £195. Demand is expected to exceed available spaces for the course, so early registration is suggested. For further information about the course, location, and tutors, visit the school’s website. Read Nadine's full press release here. We are pleased to announce the release of the 2008 Bluegrass Calendar, a striking 14-month publication that – this year – pays homage to the Women in Bluegrass. * For folks who can’t wait to get started, this edition contains the months of November and December for 2007, as well as all of 2008. Additional information can be found here. We also offer discounted pricing to associations (the calendars make great fund-raising items), retail establishments, and musicians wishing to resell items on their show dates. Please ask for details! Note: our website automatically calculates shipping charges for within the US. Orders shipping to Canada and Europe will be calculated for the actual rate of postage due. Tutte le direzioni ('Every direction'), the latest album by the Mideando String Quintet, will be officially launched at 21.00 on Saturday 10 November in the Bastione Alicorno, Padova (Padua), Italy. The launch will be accompanied by a live concert by the MSQ, to which admission will be free. The new CD features seven original songs with Italian or English lyrics, plus two covers with new arrangements by the band ('Video killed the radio stars' by the Buggles, and 'These are the days of our lives' by Queen), and Mideando String Quintet's very special versions of 'Will the circle be unbroken' and 'Turkey in the straw'. Update (October 20, 2007): Adiaha Bürkmiller informs us that, while most workshop tickets are gone, there are a (very) few left. Contact her at the address below to secure your place on this banjo journey. 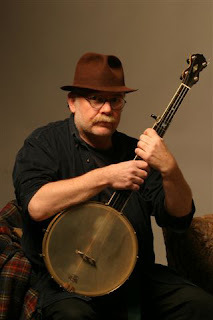 A bluegrass workshop for 5-string banjo will be held at Unterhaching in south Munich (München), Germany, on Saturday 3 November and Sunday 4 November 2007. The teachers are Rüdiger Helbig (D) and Ross Nickerson (USA). 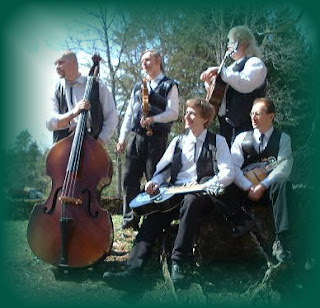 Rüdiger and his band, the Huckleberry Five, were the cover feature in the June-July 2007 issue of Bluegrass Europe. The cost of the workshop, with snacks and coffee, is €180. With single room for one night and breakfast, the cost is €250. There is also a 'Bluegrass Evening' on Saturday, with the Huckleberry Five in Weyarn/OBB. Contact Adiaha Bürkmiller: tel. +49 (0)176-23640702; e-mail. The workshop flyer can be seen here. 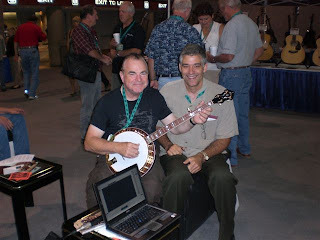 Ross Nickerson, author of the Banjo encyclopedia and many other teaching aids, will also be giving workshops in Amsterdam, Gothenburg, Stockholm, Oslo, and Copenhagen between 7 and 13 November. Guitarist Beppe Gambetta has a busy schedule during the next three months, with four solo concerts and a residential master class in Italy during 17-20 October and 13-14 December. He will also be playing nineteen solo concerts (as well as an 'Italian Guitar Night' with Franco Morone) and conducting three workshops during the 'Gitarre zweier welten' tour in Switzerland, Germany, Luxembourg, and Austria between Thursday 15 November and Saturday 8 December. Full details are on his website. Beppe Gambetta thanks all those who took part in the 2007 Workshop in Ambroz (Slovenia), which seems to have been one of the best yet. In response to the comments of students, further changes and improvements will be made in 2008. The program will be conducted by Beppe and Steve Kaufman (USA), and the two classes, each of fifteen students, will have alternate lessons from both teachers. Classes will be held only in the mornings, with afternoons being devoted to jamming and socialising. All details will be posted on the workshop website, which will soon be open to receive subscriptions. This will be the final show in this venue for 2007. In December we'll take a break but on Sunday 13 January we'll be back with a great New Year's concert with the Bluegrass Boogiemen, the Ranch House Favorites, and Grand Ole Country. Show starts at 14.00 hrs. Tickets may already be reserved via e-mail only as per right now. Tickets are €15.00. 'Het Turfschip' in Nieuwkoop is famous for its atmosphere. People really listen and we intend to keep it that way. No smoking allowed. In 2008 we'll be doing bluegrass on a more regular basis. This year we had bluegrass, western swing, country, and singer/songwriter shows. Each and every one of them were sold-out shows. For the rest of the European tour by Uncle Earl, see the band's website. Rachel Harrington, from Oregon, USA, has begun a tour in Belgium, the Netherlands, Germany, and the UK, in a duo act with multi-instrumentalist Zak Borden on vocals, mandolin, and guitar. Her work is described as 'from the crossroads of country, folk and bluegrass', and the guest artists on her new CD The bootlegger's daughter include such bluegrass musicians as John Reischman and Danny Barnes. Thanks to FOAOTMAD for the news that The long harvest, a ten-album set of ballads recorded in the 1960s by Ewan MacColl and Peggy Seeger, has been reissued on CD after being out of print for thirty years. Each disc has three or four Child ballads, each of which is represented by four or five versions ranging from older to newer texts. The purpose is to show how ballads travelled from Europe to the USA, and what became of them in the process. Many of the newer texts are truncated, humorous, or reduced to children's songs. The reissue set consists of Volumes 1-10 of the ballads and an eleventh CD of the original notes in PDF form. The sets cannot be broken up and sold as individual CDs. The full set costs $110 (p&p incl.) in the USA and is not directly available elsewhere at present. It can be obtained in Europe for $125 (p&p incl. ), through the address available from FOAOTMAD by e-mail. This great guy, who was the friend of anyone who ever played the banjo in the UK, and his wonderful music with his sister Jan were major contributions to the Midlands bluegrass scene, never to be forgotten. His innovations and inventions were known both sides of the Pond, and I personally have met USA performers who are still the proud owners of an Andy Smith capo. Our heartfelt sympathy goes out to Barbara and all Andy's family at this most distressing of times. 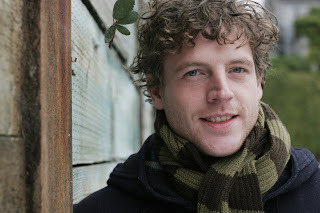 Friedrich Barniske, of the Hot String Quintet from Berlin, will bring a trio project, Wasteland Green, over to the UK for a first short visit in late October 2007, presenting songs from folk, pop, jazz, and country. As well as Friedrich, the trio consists of Susanne Werth (lead vocals) and Arne Zauber (guitar, chromatic button accordion, lead vocals). Their first CD, Beautiful tonight (Nov. 2005) was released on Acoustic Concerts Berlin Records and presents 14 tracks. More information is on the group's website.